First, the Canadiens did make the playoffs four out of the five years that Gainey was GM and amassed a record of 241-176-46-7. But the team also failed to make it past the second round each year. Maybe making the post-season is fine in a market like Atlanta, but not in Montreal. During the regular season over this time period they placed 7th in the East twice, 8th once, 1st once, and 10th in the only year they missed the playoffs. The first place finish was in 2007-2008 and they barely beat a surprising Bruins squad in 7 games and then were absolutely throttled by the Flyers 4-1 in a series that doubled as the start of Carey Price’s fall from Jesus like status in Montreal. At the time the Canadiens looked like a young team on the rise and certainly started next season’s centennial year looking that way. The Habs started 7-1-1 in October and looked poised to repeat as top seed in the East. It didn’t happen that way and the team spiraled out of control as they battled a litany of bizarre media stories including the Kostitsyns being connected to the mob. It got to the point that Alex Kovalev was sent home for a few days (fed up with the lack of discipline? speaking out against the rampant partying?) 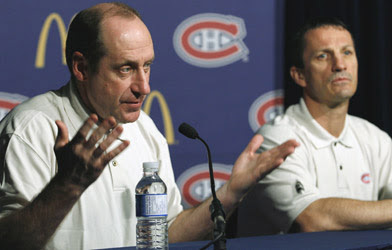 and Guy Carbonneau was eventually fired. They were subsequently swept in the first round by the Bruins. Did Gainey do enough to keep his young team in line? Or was it the responsibility of the coach? Well, Carbo was a veteran of the Montreal party scene when he was a player, so it’s unlikely he would readily discipline the players for their behaviour. It's been suggested to me that Gainey should have Carey Price live with him, just like Sidney Crosby lives with Mario Lemieux (or at least he did). That would certainly limit Price's party lifestyle and give him a veteran of the Montreal sports market to help him deal with the pressures of being a young goalie in Montreal. It's looking more likely that Price will succumb to the pressures of Montreal and never achieve his full potential as a member of the Habs. It’s clear that Gainey cannot be blamed for the disaster of the pseudo-Centennial season (actually their 99th season of play), but it happened on his watch and that's a negative. One move botched by Gainey was naming a replacement for Carbonneau. Gainey replaced Carbonneau with Jacques Martin. Martin is a defence first style of coach, which doesn’t really fit with the fast, attacking style that works well with a young, fast team like the Canadiens are. Also, Jacques Martin’s teams have always been playoff underachievers (one conference final anomaly). I don’t really understand how coaches like him still find work. This isn’t the mid-90s. The trap is over. Leave hockey, please. You’re killing it. What an impartial paragraph. If I was a Canadiens fan I would be furious over Martin’s hiring. I’d also be pissed at Gainey’s free agent signings. The Canadiens went into this past off-season with a whopping 9 unrestricted free agents. The three biggest names were Saku Koivu, who was not tendered a contract offer (likely because Habs management didn’t want him to usurp John Beliveau as longest serving captain in team history), Alexei Kovalev, who turned down his contract offer, and Mike Komisarek, who joined the rival Leafs. Gainey was aggressive during free agency and spent the Canadiens excess cap space unwisely. Brian Gionta signed for 4 years ($5 million per). That’s a lot of money for a 31-year-old with only one season with more than 60 points. That season being the first post-lockout year where no one was allowed to touch anyone small and fast. Jaroslav Spacek was signed for 3 years and close to $4 million per, despite being 35-years-old with mediocre career offensive numbers (and at least two chins and counting). The defensive overhaul also included Hal Gill, who is 34-years-old and slower than a paralyzed version of Jason Allison, for 2 years and $2.25 million. He also signed Roman Hamerlik in 2007 to a four-year deal worth $5.5 million each year. I don’t know when in Hamerlik’s career he was ever worth this type of money. Gainey also signed Sergei Samsonov to a two-year deal worth $7.05 in total in 2006. Samsonov was an amazing player in the EA sports NHL games when there was a speed burst button, but had only scored over 50 points once since 2001-2002 in the actual NHL. Montreal placed him on waivers the next season and eventually traded him to Chicago. The only real good signings by Gainey were the signing of Mike Cammalleri and the extension given to Andrei Markov. Even worse is his trade history, mainly because of one deal. This deal even made Glen Sather look intelligent (never a good sign). It’s unfathomable that the New York Rangers were able to escape from the burden of Scott Gomez’s contract which pays him an average of almost $7.4 million per year for four more years. For some reason Bob Gainey thought it would be a good idea to trade for this monstrosity while not pillaging the Rangers farm system for talent. They actually had to give up Christopher Higgins and 2007 12th overall pick, Ryan McDonagh (currently New York’s 3rd ranked prospect). For less than $150,000 more, the Canadiens could have signed Marian Gaborik, who has 30 more points and 27 more goals than Gomez. In his defence, Gaborik has glass bones. But Scott Gomez’s contract makes Jason Blake’s look reasonable. In 2007, Gainey traded Mike Ribeiro to the Dallas Stars for Janne Niinimaa. Ribeiro has scored 59, 83, and 78 points in each of the past three seasons, while Niinimaa is playing in Europe. Gainey recently acquired formerly struggling Benoit Pouliot for formerly struggling Guillaume Latendresse, which looks pretty good for both teams at this point, so he isn’t completely inept. Although this is hardly a steal considering both Pouliot and Latendresse were in dire need of a change and both are playing well in their new locales. He was also able to acquire Alex Kovalev for nothing much, so it’s not like he was JFJ. But JFJ never traded for Scott Gomez. He did make some pretty brutal signings, but I think the Habs have been so near the middle of the pack for the majority of the past decade that they haven't been able to draft at the top (like say Pittsburgh or Washington), or really generate too much excitement through dominance (like the Ducks perhaps). I see a lot of parallels between the Habs situation and your previous article on the Bruins; two teams with recent success that now can't quite put it all together. Well said. I think if Gainey was able to pull of a big trade for someone like Lecavalier then this would be an entirely different situation. Probably wouldn't have chased Gomez. Although, I'm not convinced Vinnie could handle Montreal.